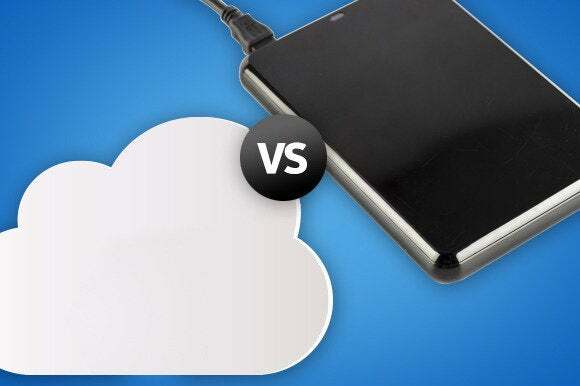 Cloud storage vs. external hard drives: Which really offers the best bang for your buck? By now, you know the basic arguments in the on-site versus off-site storage debate. External hard drives are fast (everything backed up in minutes!) and safe from hackers (you control the data), but are susceptible to theft, fire, and hard drive failure. Meanwhile, cloud solutions provide ongoing, reliable service, but are slower than on-site solutions, and (theoretically) more vulnerable to hackers. But for today, let’s put aside the usual arguments and focus strictly on cost. Assuming your data will not be hacked, stolen, or burnt to a crisp in a house fire, which solution—cloud storage or an external hard drive—is more cost effective, byte for byte? At FindTheBest, we compiled data on more than 400 external hard drives, including brands like Seagate, LaCie, and Western Digital, as well as more than 80 online backup services, including familiar names like DropBox and Box, as well as smaller companies like BackBlaze and Crashplan. Our first observation: External hard drives have a much more linear pricing structure than cloud services. The more space in a drive, the more you pay—simple as that. In the end, nearly all hard drives end up costing about 10 to 50 cents per gigabyte, with just a few exceptions on either extreme. In the chart below, glide your mouse over the blue bars to see specific cost-per-gigabyte specs. In contrast, online backup services vary widely, with features and plan types influencing the overall cost significantly. For instance, top-dollar online backup services often provide better file encryption, multiple restore points (e.g., the option to revert to either 6 hours, 2 days, or 2 months ago), and dedicated, 24/7 customer service. Inexpensive plans typically offer little more than a set-it-and-forget-it backup system. As such, the cost per gigabyte for online backup can range from a fraction of a penny to $10 or more. Glide your mouse over the blue bars in the chart below to see these wild pricing differences among the cloud storage services. The bottom line? Neither approach is flat-out more cost-effective than the other. Instead, it all depends on how much storage you need. So let’s take a look at the full range of backup scenarios, from a tiny backup to a multi-terabyte solution. In each case, we’ll pick the better option—assuming your goal is simply to save money, and nothing else. If you only need to back up a dozen gigs of photos and documents, we don’t need to crunch any numbers. The clear solution is a free online backup service. Many big-name backup services, like Box and DropBox, offer plans from 5 to 10GB of storage at a cost of $0. Meanwhile, companies like ADrive and MEGA offer up to 50GB, free of charge. Just keep in mind that these basic plans tend to have several drawbacks, like file size limits and restrictions on the number of devices you can include. You’re a simple user with simple storage needs. It’s just that you’ve got 40,000 family photos and a temperamental desktop that might crash any day. Unfortunately, the 20 to 100GB range is a bit awkward, with few free solution— and upcharges for those extra gigs. External hard drives aren’t an attractive option. A 100GB drive will end up costing you between $1 and $4 a gig—highway robbery these days. Instead, snap up a low-cost cloud plan like hubiC, Box Starter, or OpenDrive Home. Today’s average consumer will likely need storage somewhere in this range, enough for a small family or one HD movie enthusiast. Here, the median cost for an online service per gig (per year) is 42 cents, compared to 41 cents for an external hard drive—virtually dead even. Consider, however, that 90 percent of external hard drives will last for three years without failure. (After that, the chance of failure roughly doubles, year after year.) So if you assume a responsible hard drive owner will replace the drive once every three years, it’s only fair to compare that 41 cents for the external drive to $1.26 (42 cents x 3) for three years of a cloud-based service. Yes, there’s a 10 percent chance your external hard drive will fail in those first three years, so a cautious consumer might consider the extra 82 cents an insurance policy. But for those willing to take the risk, an external drive is more cost-effective for backups in this range. Here, things get a little closer. Based on our data, three years of an online service in this range will cost you about 36 cents per gig, while three years of an external hard drive will clock in at about 21 cents per gig. The math says an external drive is the right choice here, but that insurance policy is suddenly only 15 cents. Winner: we’ll call this one a draw. Beyond one terabyte, the decision becomes easy again. External hard drives in this range are certainly efficient (only about 12 cents per gig, on average), but cloud-based plans are even better. Once you hit a full terabyte, the incremental cost of more space becomes less and less of a factor. For three years of storage, you’ll pay only about 4 cents per gig for an online plan. In the end, cloud-based solutions are the overall winner, proving either comparable or better cost per gigabyte in all but one category. What's more, online backup services are becoming cheaper and more accessible every year, which will likely make the choice even easier over time. The prevailing wisdom tells us to back up both onsite and offsite, but soon, the external hard drive may just go the way of the compact disc.